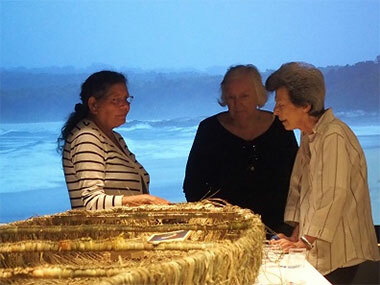 Yuin woman, Aunti Phyllis engages with visitors at the Australian Museum's 'Weave' Festival. In an extraordinary first – extraordinary because it's the first time in 180-odd years that the Australian Museum in Sydney has taken the opportunity to celebrate the local Gadigal culture – we're in the middle of 'Weave', a Festival of Aboriginal and Pacific Culture. The extent of the Festival ranges from meditation in the Wiradjuri way (Winhangadurinya) to dancing in nine different Indigenous ways, captured in virtual reality in a film called 'Carriberrie' (Corroboree – got it?) which shows ten times between now and the end of the month and needs to be booked. 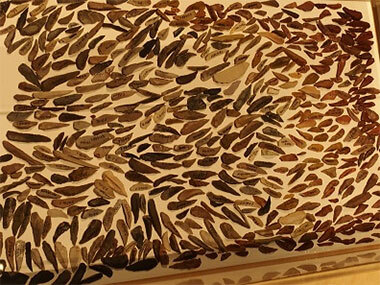 South Coast elders Auntie Phyllis and Uncle Steve are there in during mornings on Fridays and Saturdays and are delighted to talk about weaving, fishing, shell collecting and middens as they themselves weave a nawi/canoe from lamandra reeds. It wouldn't actually hold water, but is of the style that would have traditionally been made from tied bark so that the Gadigellean (Gadi women) could head out on to the water in Botany Bay or the Harbour, light a guwiyan (fire) on a bamal (clay) base and do a bit of magari (fishing). Mind you, they'd probably have paid a little for their skill at magari by losing the top of the little finger on the left hand in order to cast and haul in their fishing lines more easily. Amazingly, a spider's web thread was wound around the finger to kill the tip off. For magura (fish) were a staple part of the Gadigal diet – Gadigal being the male equivalent of Gadigellean, for they all lived on the land of the grass tree (Gadi) or Xanthorrhoea. As I hope you can tell, one of the subtexts of the Festival is language familiarisation; though, as far as I can see, there are no actual language classes on offer as there were during the Sydney Festival. But how interesting to discover that bugi is skin and bagi is bark – the linkage between human and nature's outer coverings was more obvious to the Gadigal than to 'civilisations' less attuned to that nature. And what a valuable plant that Gadi was. Under its skirt of fronds, many a possum might be found hiding; almost as easy hunting as the birds which flocked to the 'Black Boy's' flower and then got inebriated on its pollen. When the flower was over, a perfect straight spear offered itself; and its stone point could be affixed with the plant's glutinous resin. We also learn how the stone tips, axe heads, etc were created – and it would seem that Bondi (or Bondee) was a popular place over the centuries to create them. Masses found there are displayed like a school of little fish trying to flee from a snapper. Rock art is also displayed in photographs – the whales and emus outlined in chalk to clarify them – which, of course, raises the question for me as to why no appropriate Gadigal (or Guringai) can be found to reincise such important images which have diminished in white invasion time from an inch deep to mere millimetres. However, the link between the incised emus and the dark nationally-recognised emu god-figure amongst the stars in the sky, known as Daramulan in Sydney, is little explained. Other images from the 1820s are selected purposefully. They're by Pavel Mikhailov, a Russian visitor, who took them home to the State Archive. But they're chosen here in preference to contemporary English or French images because curator Laura McBride felt they were less prepared to emphasise the primitive in Aboriginal imagery. Certainly the pair of Gadigellean by Mikhailov that I picked out to illustrate the point are quite different from comparable portraits by the likes of Nicholas-Martin Petit or Augustus Earle. Although the aspects of the Weave Festival involving workshops and demonstrations will conclude at the end of March, this pioneering exhibition goes on for 4 months until the end of June. Of course, the Museum also has a general Indigenous gallery; it also has a brilliant 200 Treasures exhibition of its most significant objects in the historic Long Gallery, showing that old-style, pre-digital museology can still whet the appetite and feed the mind.